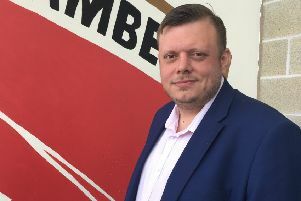 Morecambe boss Jim Bentley has a defender at the top of his shopping list after bringing seven new players to the Globe Arena so far this summer. The Shrimps begin their pre-season campaign at Bamber Bridge on Tuesday (7.30pm), 24 hours after Bentley reinforced his goalkeeping department with the signing of Mark Halstead. He joins fellow new boys Zak Mills, Rhys Oates, Jason Oswell, Andrew Tutte, James Sinclair and Jordan Cranston in a revamped squad ahead of the new season. Halstead’s arrival took Bentley’s senior squad to 17 players but the shopping has not finished yet with an alternative to central defensive duo Sam Lavelle and Steve Old the priority. “We’re in a better position than we have been before but there are still areas of the team that we want to fill,” Bentley said. Alex Kenyon can drop from midfield into the defence if required, having done so to good effect in previous seasons. It may not be an ideal scenario for the Morecambe camp but Kenyon’s ability to play in more than one position is an attribute that Bentley seeks in some of his would-be signings. “That’s what we need,” Bentley said. Tuesday’s game comes after a week-and-a-half of training for the Shrimps squad. As with previous years, the training facilities have caused issues for the Morecambe camp – but not in the way people might imagine. “Last season, Turner’s Field was waterlogged but now, with all the sun we’ve had, it’s like concrete,” Bentley said. “It’s very hard, especially on the feet and for the keepers diving, but it is what it is.